Michael Larner earned his Master’s Degree in Viticulture & Enology at the University of California, Davis and has a Bachelor’s Degree in Geology from the University of Colorado at Boulder. His formal training in wine continued with cellar apprenticeships at Marchesi Antinori’s Tenuta Guado al Tasso (Bolgheri, Tuscany) and E. Guigal’s Château d’Ampuis (Rhône Valley, France). He previously worked with Santa Ynez-based wineries Babcock Winery and Rusack Vineyards. He has been making wine since 1999. Michael is co-founder of the Ballard Canyon AVA and recently served as president of this newly-founded AVA (American Viticulture Area). Ballard Canyon is one of our nation’s smallest AVAs and is focused on the production of quality Syrah. Michael is currently vice president of the Santa Barbara County Vintners Association and served as its president from 2010-2014. Michael founded the Buellton Bodegas in 2013, a truly unique co-operative winery with 13 small production wineries. Michael teaches winemaking and wine appreciation classes at Allan Hancock College. He has served as a wine judge at Vinitaly in Verona (Italy) and the California State Fair in Sacramento. Michael’s wife, Christina LoCascio Larner, helped make the first vintage of Larner wines in 2009 and has been strategically involved ever since. She’s also a locally affirmed artist who uses wine as a medium for her paintings. She creates a wide spectrum of tones and pigments using the color of various grape varieties. Christina has worked in almost every facet of wine: at a wine industry magazine, managing tasting rooms, retail and wholesale wine sales, as well as winemaking. After working for wineries and making wine in Temecula, California she headed back to Santa Barbara County where she had received her Bachelor’s Degree in Art at UCSB. Here she found her calling working for Artiste Winery, teaching art classes and painting labels for wine releases. She also began experimenting with using wine as paint. Her pieces range from vineyard landscapes to figurative and can be seen at www.christinalocascio.com. After helping make the first vintage of Larner wines, the second year found Michael and Christina growing their family as well as grapes. Their son Steven was born late that year (after harvest thankfully!) and three years later came baby girl Sienna. Christina now runs the Los Olivos General Store and puts her creativity to use in merchandising — she says it is like a still life you keep moving around with the seasons and products — adorning the store with things that also fill the spirit. 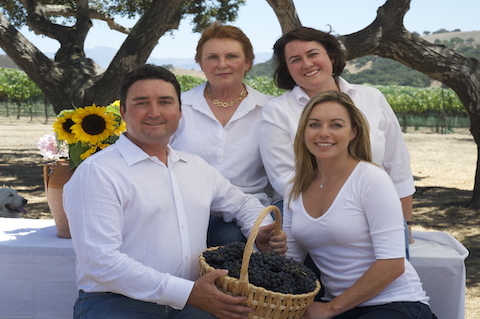 Driven to find a family property they could all share in winemaking, founders Christine and Stevan Larner came to the Santa Ynez Valley. When they first set eyes on the property in Ballard Canyon in 1995, they knew this was their route to a family legacy. Christine still lives on the property but Stevan passed away in 2005. Stevan Larner was an Oscar-nominated, Emmy winning cinematographer who spent much of his early career in Europe where he first learned to love wine. Early in life, Christine immigrated to America to study, but fondly remembered her farm upbringing in Europe. Stevan studied Film at the Sorbonne in Paris and then worked on a project in for the french government document vineyard practices, which opened his eyes to viticulture and the Bordeaux region. When the two married, work brought them eventually back to Europe, when the family moved to Italy. On location Christine remembers sending her daughter Monica to the local wine purveyor in Rome, buying a month’s worth of fresh (non-aged) wine for $1. Visiting her mother-in-law in the Rhône Valley was also a delight; the Mediterranean food and wine culture had settled in Stevan and Christine’s bones. When the couple found the ranch property in Ballard Canyon, they set about clearing the land to plant vineyards in a place that had never before been cultivated. It was amazing to see the land toiled by machines, and analyze the soil and weather. Michael took care of all the soil and geology matters, and the land told the family what to plant: Rhône varietals. And the rest is history. No doubt, Christine’s favorite wine is the Grenache – since she hand-trained each individual cordon of those vines – and the Malvasia Bianca from a small section of the vineyard the family has nicknamed “Little Italy”. Michael’s sister, Monica Larner, is a wine writer based in Rome. Following ten years as Italian Editor with the Wine Enthusiast, she now reviews Italian wine for Robert Parker’s The Wine Advocate. Monica takes a smaller role at the winery, but continues to contribute her knowledge in the final wines: from blends to aging time.